Well, it wasn’t actually Kiefer Sutherland who got torched, but his little doll. 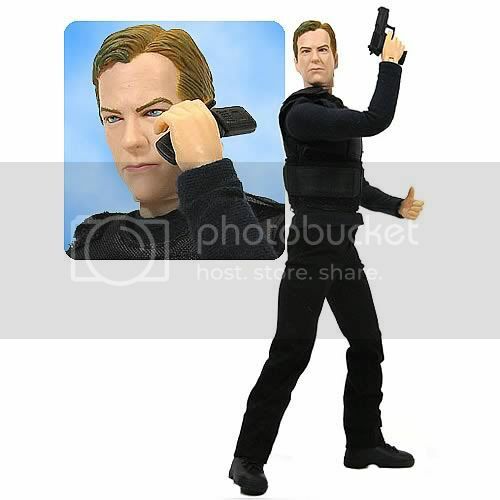 McFarlane Toys’ first “24” action figure based on Jack Bauer, Kiefer’s character on “24”, is expected to hit store shelves in August, with the second scheduled for holiday season 2007 release. It could have come out a year earlier if they hadn’t sent the figure to Kiefer to get his approval. As Kiefer told us during a TV critics set tour, he was working on the film “The Sentinel” when the prototype for the doll was sent to him. Until he got the phone call later from the company asking him how he liked the action figure. So, I asked Kiefer how the gentleman in Japan took the news of his creation’s destruction. So, does this stunt rank right up with the most embarrassing thing he’s ever done? In fairness, Jack Bauer would have been proud. Kiefer asked first and offered to pay for the tackled tree. Still, not something he looks back on with any fondness. Of course, footage of the little doll burning would’ve been nice, too…Someone really ought to follow that boy around with a camera 24/7.